If you are a Windows Phone developer using the XAML + C# Application model, you would have noticed that the XAML design view (designer) takes some time to load/render the controls on the page during the design time. If you don’t need the Visual Studio 2012 to open the XAML in design mode, you can disable the XAML designer from loading automatically by following the below steps. 1. Launch Visual Studio 2012. 2. 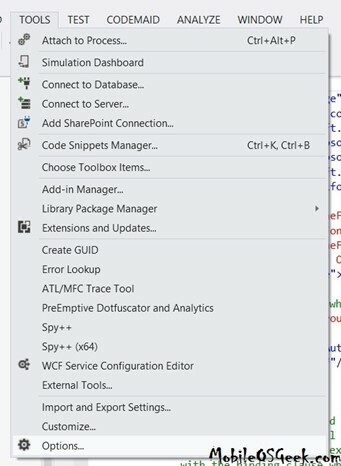 Click “Tools” -> Options menu in the Visual Studio 2012. 3. In the Options Dialog, Expand the “Text Edit” node and then expand the “XAML” node and click “Miscellaneous” node. 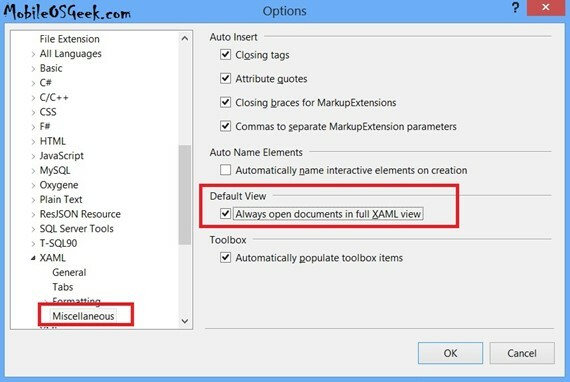 Enable the Option “Always Open Documents in Full XAML View”. That’s it. If you open the xaml file of your windows phone project in Visual studio 2012, it will always open in the full XAML view.